With Renewable Source, you can choose how much of the energy you purchase comes from renewable sources and directly influence the amount of renewable energy on the power grid. For a few dollars more a month, you can add more renewable energy to the power grid equal to a percentage of your monthly energy use. It’s an easy way to reduce your carbon footprint with nothing to install or maintain. The extra cost is added to your regular monthly bill and the power is delivered to the electric grid on your behalf. Flexible—choose from four options to add more renewable energy to the power grid equal to a percentage of your monthly energy use: 25 percent, 50 percent, 75 percent or go all in at 100 percent. Simple—no equipment necessary and no contract. Predictable and affordable pricing without a long-term commitment. You can leave Renewable Source at any time. Satisfaction of knowing you are contributing to a cleaner and lower-carbon energy future. In 2019, the energy supplied through Renewable Source will be generated by wind in Iowa. Other sources of renewable energy may be a part of the program mix in the future. Click here for a printable application form to submit by mail. Renewable Source is supplied with energy from Crystal Lake Wind Farm in Winnebago and Hancock counties in Iowa. Today, Renewable Source is 100 percent wind, but it could include other forms of renewable energy—solar, biogas, hydro, or biomass—in the future. How does the renewable energy get to my house? It’s not possible to direct the wind energy from the Crystal Lake Wind Farm directly to your home. The renewable energy from Crystal Lake flows into the power grid where it is mixed with electricity from other renewable and conventional sources. Renewable Source and all other Minnesota Power customers draw power from the grid to reliably and safely meet their electricity needs. By supporting Renewable Source you are helping to add more renewable energy to the mix of energy sources that feeds the power grid. We all know that sometimes the wind doesn’t blow, but those calm days won’t affect the reliability of your service. Your electric service draws power from the overall electric grid, which is supplied by a mix of sources. Enrolling in Renewable Source means there is more renewable energy on the power grid. Doesn’t Minnesota Power already supply renewable energy to my home through its EnergyForward resource strategy? Yes. The power we supply our customers comes from a variety of resources. Our current mix is more than 30 percent renewable, including wind, hydro, solar and biomass. The renewable electricity supplied as part of Renewable Source goes above and beyond what we supply to all of our customers. One Renewable Energy Credit is created each time one megawatt-hour of electricity is generated and delivered to the power grid. These credits, also called certificates, are used to measure the amount of renewable energy produced and to prove that utilities or businesses are meeting their renewable energy goals. As a Renewable Source participant, the RECs are retired on your behalf and are not counted toward Minnesota Power’s compliance with the state’s renewable energy standard. By retaining rights to the RECs, you can say that your home is powered by renewable energy and enjoy the satisfaction of contributing toward a cleaner and lower-carbon energy future. How much renewable energy can I get through Renewable Source? Customers can choose to add more renewable energy to the power grid equal to 25 percent, 50 percent, 75 percent or even 100 percent of their monthly energy usage. By signing up for Renewable Source, you are directly influencing the amount of renewable energy available on the power grid. How much does Renewable Source cost? The premium price you pay—$0.00994 per kilowatt-hour for residential customers—will stay the same through 2019, and ensures that renewable energy is generated on your behalf and delivered to the power grid. 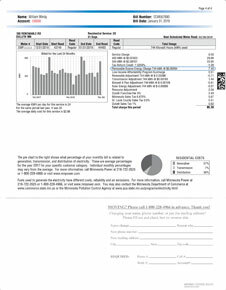 How does Renewable Source affect my bill? 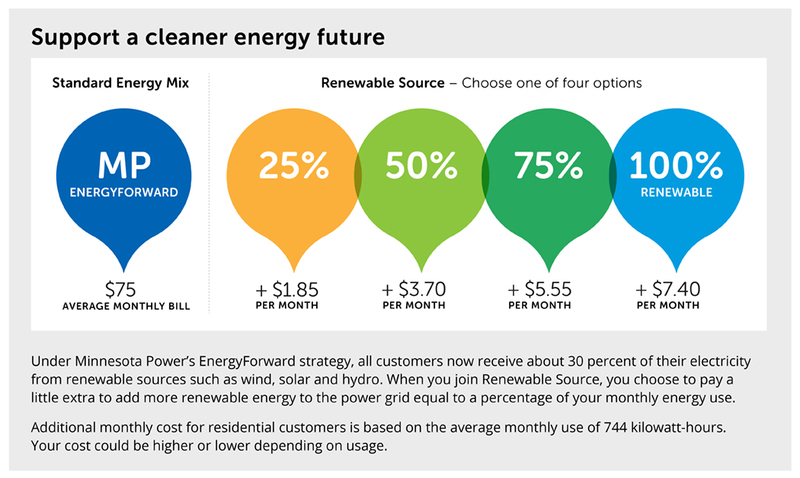 Participating in the Renewable Source program will affect your monthly Minnesota Power bill in two ways: a charge for the renewable energy and a credit for fuel and purchased energy. The renewable energy charge will appear as a separate line item on your bill called Renewable Source Program Charge. This charge is based on the percentage of energy usage that you elected to get through the Renewable Source program multiplied by the cost of the renewable energy. The fuel and purchased energy credit is included in the Resource Adjustment portion of your bill. Part of the Resource Adjustment is made up of the cost of fuel used in our generating stations and the cost of purchasing energy from other suppliers. When you sign up for Renewable Source, you are using energy from renewable resources that don’t have any associated fuel costs. We’ll credit you for fuel costs, which will vary month to month. 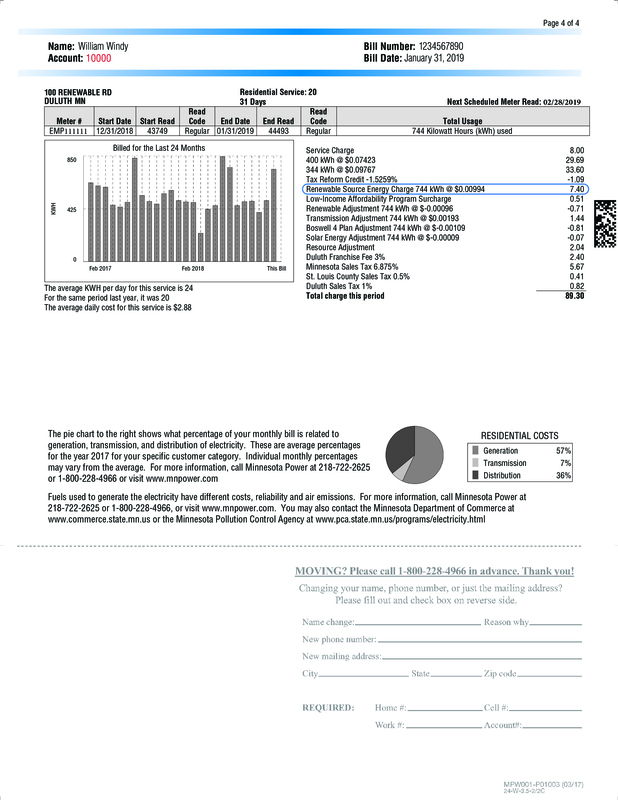 Call 218-355-3720 (option 5) to talk with a Minnesota Power representative or email renewableprograms@mnpower.com. What about commercial and business customers? Commercial and business customers also can sign up for Renewable Source. Contact a Minnesota Power representative at 218-355-3720 (option 5) or email renewableprograms@mnpower.com to learn how we can help you reach your sustainability goals. Contest for two (2) $100 bill credits starts Mon., Apr. 8 and drawing for the winner will be Mon., Sept. 9, 2019 (6 month contest). Contest ends at midnight on Sept. 8. Winners will be contacted by phone and/or email and publicly announced on our social media channels the week of Sept. 9 (with winner’s approval). Register for Renewable Source (choosing any of the percentage options) for one year. Be a customer of Minnesota Power at the time of the drawing. Employees and their immediate family members are not eligible for the drawing. Retirees of Minnesota Power/ALLETE are not eligible to win. Winners will be randomly selected using an online tool from the pool of qualified entries. Winners will be contacted by phone and/or primary email listed on their MyAccount profile or Renewable Source application. Winners will see the $100 bill credit on their bill the month following their name being drawn. 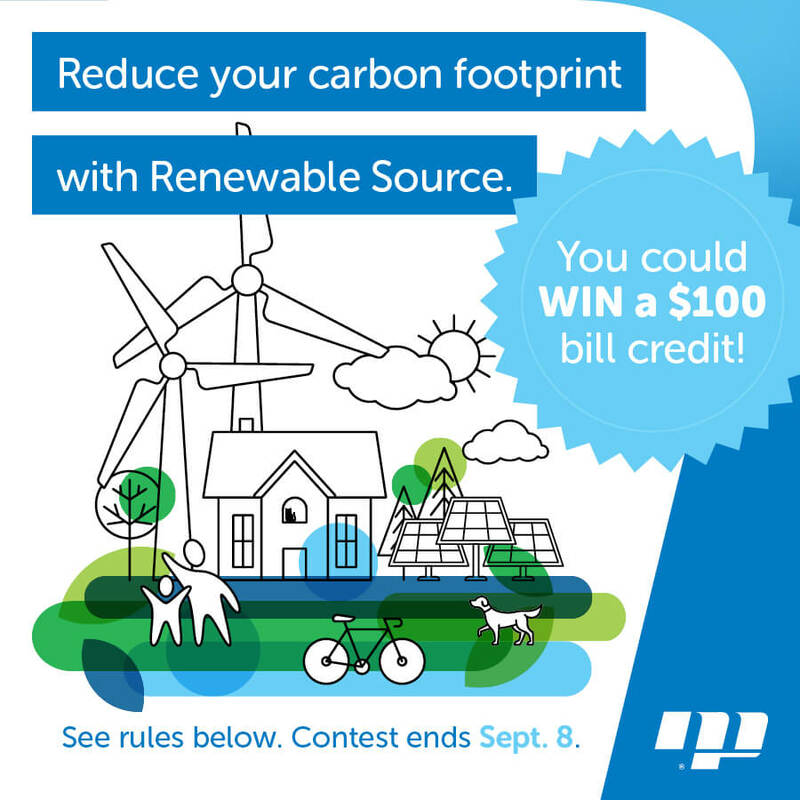 (i.e., if you’re drawn as the winner on Sept. 9, the credit will appear on your October bill, unless the billing date has passed, in which case, the credit will appear on the November bill). Winners must be over 18 years old. Winners may be asked to sign a photo release as necessary.